Move over LA LA LAND. Lovers of romance have a new movie to watch - the quietly beautiful and unassuming love-letter, PATERSON. Directed by Jim Jarmusch, the film stars Adam Driver (THE FORCE AWAKENS) as a mild-mannered bus driver called Paterson, who also happens to live in Paterson, New Jersey. As he drives the morning shift, he smiles wistfully to himself as he listens to the funny conversations of his passengers. Some of things he notices and sees find their way into his poetry (written by real-life poet Ron Padgett), much of which is addressed to his girlfriend Laura (Golshifteh Farahani). She is a creative soul too - decorating their house, her clothes and cupcakes in abstract black and white patterns. She utterly supports her boyfriend in his poetry and he her wide-eyed dreams of success. At first they seem somewhat naive, but this is a loving relationship played without irony. I suddenly realised how rare this is to see on screen - a couple quite simply in love - accommodating of each other's foibles - supportive. 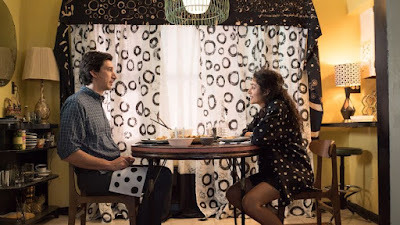 But PATERSON isn't just a love letter to this beautiful couple, but a love letter to the city of Paterson itself - or more broadly to the old dusty forgotten communities that were left behind by modernisation. Just as Paterson - the man - quietly refuses to get a smartphone or an alarm clock - the city of Paterson is an ex-industrial town, down-at-heel, full of romantically photographed deserted old factories and vacant plots with overgrown weeds. It's a testament to Jarmusch's sensitive camerawork and lighting that the town manages to look sun-dappled and romantic regardless. This love of small town lore is best seen in the scenes in the local bar, where the same people meet night after night and stubbornly refuse to have anything exciting happen. When the bus breaks down - it just breaks down. There's no deathtrap fireball. In other words, PATERSON is a movie that resists narrative convention. You don't need to have a bunch of stuff happen, or to be in a glamorous locale - to feel a deep emotional connection to characters on screen. There can be poetry in the everyday, if you only have the patience and the kindness to look for it. PATERSON has a running time of 115 minutes and is rated R (not sure why). The movie played Cannes, Toronto and London 2016. It will be released in Germany on November 17th, in the UK on November 25th, in France on December 21st and in the USA on December 28th.